Plastic surgery rates have risen once again, new figures released on Monday reveal. Almost 18 million Americans had a cosmetic procedure done in 2018, a two percent increase from 2017, according to the American Society of Plastic Surgeons. The report revealed that more than 1.8 million surgical operations were performed with the top five being breast augmentations, liposuction, nose reshapings, eyelid surgeries and tummy tucks. About 15.9 million were nonsurgical procedures and the most popular were Botox, soft tissue fillers, chemical peels, laser hair removal and microdermabrasion. Plastic surgeons told DailyMail.com that the increasing rates are due to a mix of influence from celebrities and social media, an aging population that wants to remain ‘relevant’, and patients trying to fillers and injectables first before deciding to go under the knife. The report showed that three of the top five surgical procedures were focused on body work. While rates for tummy tucks stayed about the same, breast augmentations and liposuctions increased by four percent and five percent, respectively, from 2017. 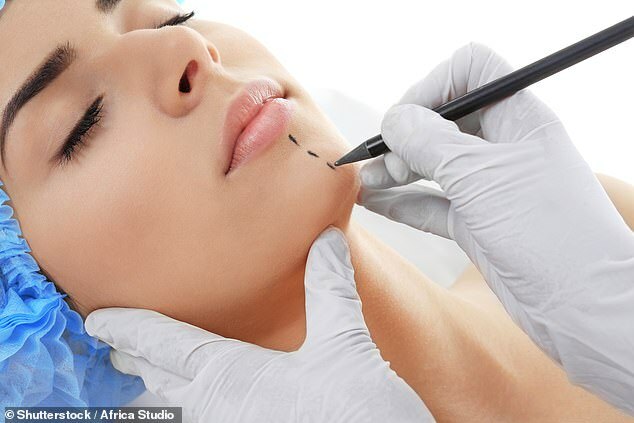 Dr Stuart Linder, a board-certified plastic surgeon based in Beverly Hills, California, who focuses on body work, told DailyMail.com that he believes the number of augmentation also includes people who want to revise their first procedure. ‘I bet that number includes re-dos, there’s less of a number of primary augmentations and a higher number of revisions and explantations,’ he said. From five years ago, Dr Linder says he’s seen about a 35 percent increase in women who need follow-up breast augmentations or completely want their implants removed. Dr Norman Rowe, a board-certified plastic surgeon in New York City, told DailyMail.com the numbers are indicative of an aging population. Procedures such as laser treatments to tighten or ‘rejuvenate’ skin, toxin injections to paralyze face muscles and ease frown lines, chemical peels, and freezing and killing unwanted fat, are fast overtaking traditional surgery. More and more clients opt for procedures that require no anesthesia, less recovery time, and present fewer risks. ‘The growth of non-surgicals is pretty much exponential,’ ISAPS president Renato Saltz said. In 2015, Botox injections were the most popular procedure with 4.6 million performed by plastic surgeons, followed by hyaluronic acid injections (2.9 million) to iron out wrinkles and plump up lips. Surgical breast augmentation was in third place with 1.5 million procedures, followed by liposuction with 1.4 million and operations to lift and shape eyelids at 1.3 million. Genital resculpting is another wide open field. ‘The demand is not there yet, but 10/15 years ago there was also no demand for female genital rejuvenation,’ said Bernard Mole, a Paris-based plastic surgeon. ‘Liposuction, tummy tucks, eyelids are procedure for people who are more in their 40s and 50s,’ he said. The two facial surgical procedures in the top five – nose reshapings and eyelid surgeries – fell from last year, the report showed. However, Dr Linder and Dr Rowe believe this is because of the latest nonsurgical options for those who want changes to the nose or eyes. They say many facial plastic surgeons use injectables and fillers with their patients before turning to surgery. ‘They are doing injectables to the tips of the nose, the [bridge] of the nose, to see how patients like it before they’re ready for a permanent change,’ Dr Linder said. For the nonsurgical procedures, including Botox, soft tissue fillers and laser hair removal, Dr Linder said the numbers are shocking. The report showed that Botox had a three percent increase in procedures in 2018 from 2017 – and an 845 percent increase from 2000. ‘That’s a nearly 10-fold increase in 18 years, that’s shocking,’ Dr Linder said. He said that many patients opt for injections because they are scared of having face lifts and eyelid surgeries. ‘They want something that’s quick healing with minimal down time and less chance of a chance of something going terribly wrong,’ Dr Linder said. Dr Rowe says that about 70 percent of what plastic surgeons do nowadays are nonsurgical procedures. Dr Linder says he believes part of the reason for the rise in procedures is because the stigma surrounding plastic surgeries is decreasing. Dr Linder says one way that clearly shows the normalization of plastic surgery is the lack of shows on TV. ‘Besides Botched on E! there’s few to no shows on plastic surgery anymore,’ he said. Dr Rowe says that the impact of celebrities and social media – namely the Kardashians – on the rising numbers can’t be ignored. ‘Celebrities and social media have a dramatic impact,’ he said. ‘In 2019, we’re looking at our faces and bodies more than ever before.